Zen Buddhism is perhaps best known for its emphasis on meditation, and probably no figure in the history of Zen is more closely associated with meditation practice than the thirteenth-century Japanese master Dogen, founder of the Soto school. This study examines the historical and religious character of the practice as it is described in Dogen's own meditation texts, introducing new materials and original perspectives on one of the most influential spiritual traditions of East Asian civilization. The Soto version of Zen meditation is known as "just sitting," a practice in which, through the cultivation of the subtle state of "nonthinking," the meditator is said to be brought into perfect accord with the higher consciousness of the "Buddha mind" inherent in all beings. This study examines the historical and religious character of the practice as it is described in Dogen's own meditation texts, introducing new materials and original perspectives on one of the most influential spiritual traditions of East Asian civilization. 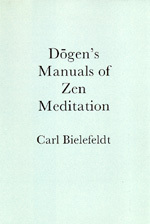 Carl Bielefeldt is Associate Professor of Religious Studies at Stanford University.